When you are looking for a luxury mid size SAV, you want to find something that is popular and that is popular for a reason. The BMW X5 has much to offer and it is the type of vehicle that has earned its place in the vehicle market. 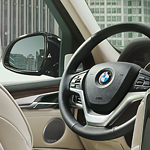 We know that you will appreciate the improvements that have been made to the new BMW X5. We feel that these improvements will make your driving experience better and that they will help this vehicle suit your needs well. The horsepower that this vehicle holds has grown bigger, and the suspension on the vehicle has been made better. There are times when any driver can become a little distracted and start to drift out of their lane. If that is something that happens to you sometimes, you will appreciate the warning system that is built into the BMW X5. This vehicle is going to let you know when your vehicle is drifting where it should not be.